Used in glass lined steel reactors and vessels, Ethylene nozzle liners eliminate damage to fragile nozzles during the insertion and operation of dip tubes, Spargers and instrumentation. Nozzle liners also reduce erosion of the glass or alloy vessel nozzles by steam or abrasive materials, preventing process contamination and expensive repairs. Solids build-up is also reduced. They are provided in lengths to meet your exact requirements. A unique tight radius bend capability is ideal when a diverter is required to deflect liquid or gas either toward or away from a vessel wall. 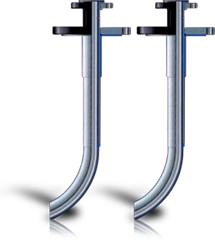 The curvature at the bottom of the tube simplifies the installation of the dip tube in reactors with limited overhead space. Variations of the standard diverter's geometry can be accommodated in most cases, please contact the factory for assistance. The AGI Dip Tube is intended for use in services where the combination of length and loading prohibit the use of standard Ethylarmor DF Dip Tubes. The larger outer diameter reinforcing pipe significantly increases the ability of the dip tube to withstand external loading. Severe agitation applications of smaller diameter Ethylarmor dip tubes may require additional reinforcement of the dip tube. Ethylene can offer Schedule 120 or even Schedule 160 reinforcing pipe for special applications. 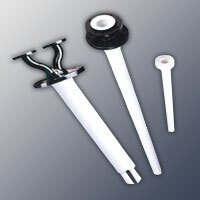 Ethylene's solid PTFE Spargers are fabricated from heavy-walled virgin PTFE tubes. All flanges are threaded onto the tube and pinned in place. Spargers are drilled to your specifications—number and diameter of holes, distance from the end of the tube, and length of drilled section.